View More In Cooling Fans. 2.DC 12V portable rotatable double heads air fan. 4.Mini shape design but provide strong cool wind. 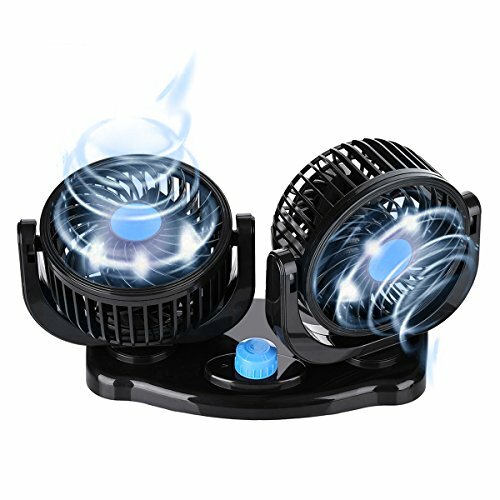 Plug and Play& Rotatable-- Cooling air fan with 360 degree rotatable and adjustable 2 speed making it use more conveniently. Low Energy Consumption &Two heads fan- -12v fan With DV power of 6.5W consumes less energy than air conditioner, dual heads design can meet the needs of several people. Low Noise &Strong Cool -- High-quality materials offers strong cool and quiet wind<50dB,12v fan will not disturb the normal rest. Compact Size - -Mini electric car fan don't take up space and will not cause visual blind spot. Adhesive pads help to firm it on dashboard or the seat armrest area. Used Indoor or Outdoor - -12v car air fan fits all the family and Vehicle Car SUV RV ATV Boat etc,can ventilate the air in your vehicles effectively. If you have any questions about this product by Tvird, contact us by completing and submitting the form below. If you are looking for a specif part number, please include it with your message.